AIDS (acquired immune deficiency syndrome) is caused by HIV (human immunodeficiency virus), and is a syndrome that leaves the body vulnerable to a host of life-threatening illnesses. There is no cure for AIDS, but treatment with antiviral medication can suppress symptoms. 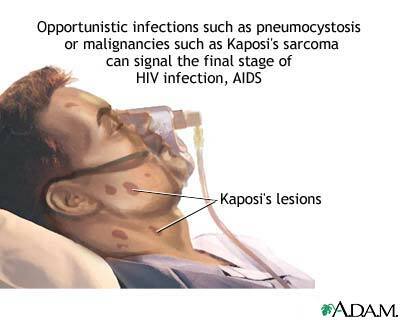 AIDS is universally fatal, in large part due to the proliferation of opportunistic infections. Updated by: David C. Dugdale, III, MD, Professor of Medicine, Division of General Medicine, Department of Medicine, University of Washington School of Medicine; and Jatin M. Vyas, MD, PhD, Assistant Professor in Medicine, Harvard Medical School, Assistant in Medicine, Division of Infectious Disease, Department of Medicine, Massachusetts General Hospital. Also reviewed by David Zieve, MD, MHA, Medical Director, A.D.A.M., Inc.